We finally used the spiralizer to make zoodles! We both enjoy using the spiralizer because it's fun to watch the veggie turn into spiral strings. There's not much waste. Plus, the core and ends can be used in compost (if you compost) or saved and later used to make a vegetable stock. It doesn't take long to saute the zoodles. We saute a bit of chopped onion in olive oil before adding the zoodles and then when they seem softened, we squeeze in fresh lemon juice. 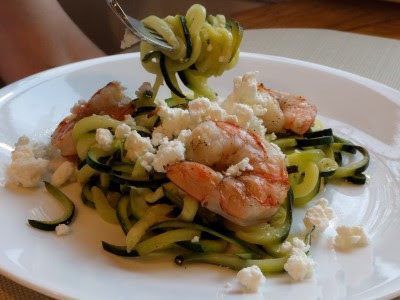 Then we top the zoodles with crumbled feta & grilled shrimp. This is really tasty and not a super heavy meal. It's a nice change for us because usually we slice and grill zucchini. That gets a little boring after a while. It's also nice because the spiralizer is quick and the zoodles cook quickly. No need to prepare in advance or get home early, it can be done after work, even if you get home at 7 pm. It's a good warm weather meal because it's so quick and it's not heavy. It would also be good with chicken. We grilled our shrimp in advance, skewering them, brushing them with olive oil, and grilling until done on a Sunday afternoon. Then we stored them in a container in the refrigerator until we made and ate the zoodles. We had about 10 shrimp for each zoodle meal (5-6 for SP and 4-5 for me). Saute the onion/shallot in olive oil in a pan. Meanwhile, spiralize the zucchini. Our spiralizer has 2 noodle sizes, we prefer the smaller (skinnier) noodles. How much zucchini you need depends on the size of the zucchini and your appetite. When we had small zucchini, we used 2 for one meal and had no problems eating all of it. A medium size zucchini made enough noodles for us for one meal and gave us a little more than the 2 small ones. A large zucchini would probably leave us with a small amount of leftovers. Once the onion/shallot is softened, add the zoodles and saute until your desired softness. Squeeze fresh lemon juice all over the zoodles and toss. You could grate in some lemon zest, too, for more lemon flavor. 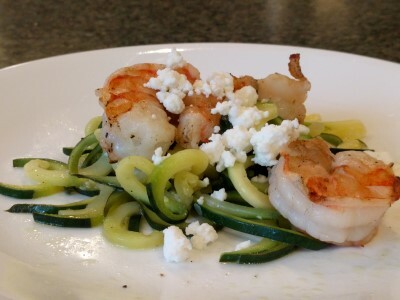 Place the zoodles on a plate and top with as much/little feta as you like and as many/few shrimp as you like.